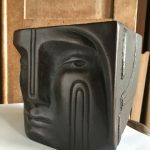 Jo Sweeting gained a degree in sculpture from Newcastle polytechnic and a PGCE from Brighton polytechnic. 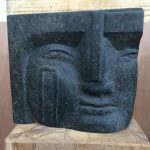 Her apprenticeship at the Skelton Workshops in Sussex, where she now teaches, has been the most formative influence on her stone sculpture and letter carving. The late John Skelton was the nephew of Eric Gill and Jo’s work descends from this tradition. 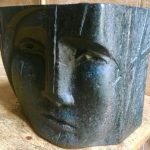 She has exhibited in numerous galleries including the Salisbury Arts Centre, Manchester City Art Gallery, West Dean College and the Garden Gallery, Hampshire. Her public sculptures include two major pieces for the American Express Community Stadium in Brighton. She is a tutor at West Dean College and Ditchling Museum. 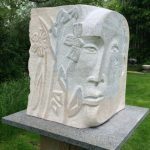 She works mainly in Ancaster and Portland stone enjoying the physicality of the medium. Natural forms and ideas taken from poetry and the interweaving of memory and its influence on the present inspire her work. This series of heads is based on the concept of ‘Shul’, a marking which remains after the thing that made it has passed. A dry riverbed or hollow an animal made in the grass are ‘shul’. 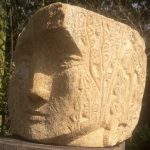 Jo is also a prolific print maker and her creative process begins with drawing and large scale woodcut prints prior to carving directly on the stone. Recently she has been working with Common Ground on a print project for the Yorkshire Sculpture Park which is called ‘Time and Place’. It is a celebration of the small particularising elements that make an area memorable or special. Her wood cut images are directly related to her stone carving and the images feed backwards and forwards between stone and print. 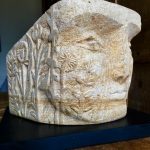 She begins carving into the stone before the image is fully formed in her mind, it is released from but also governed by the physical presence of the material and the finished works often retain the impression of the block they emerged from.